Happy Friday!!! 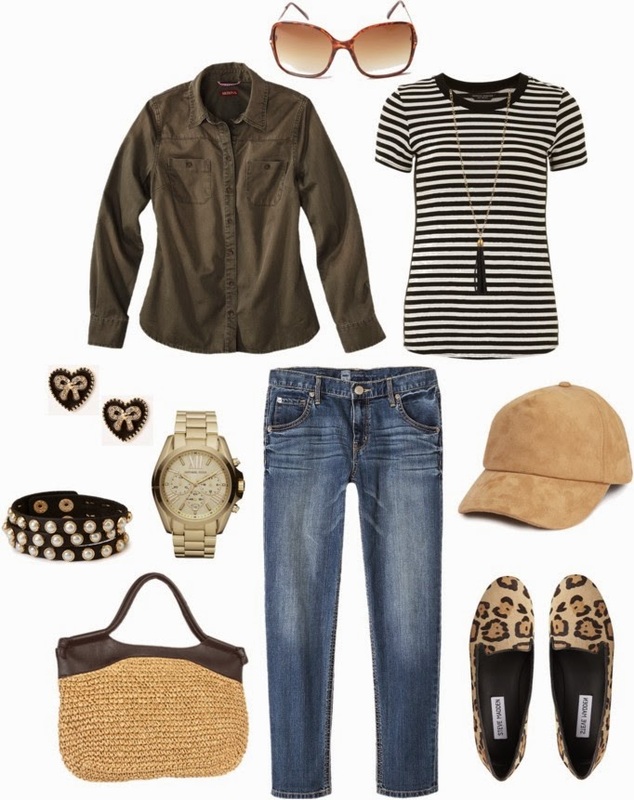 Here is another round of an Instagram outfit of the day (#ootd) recreate. 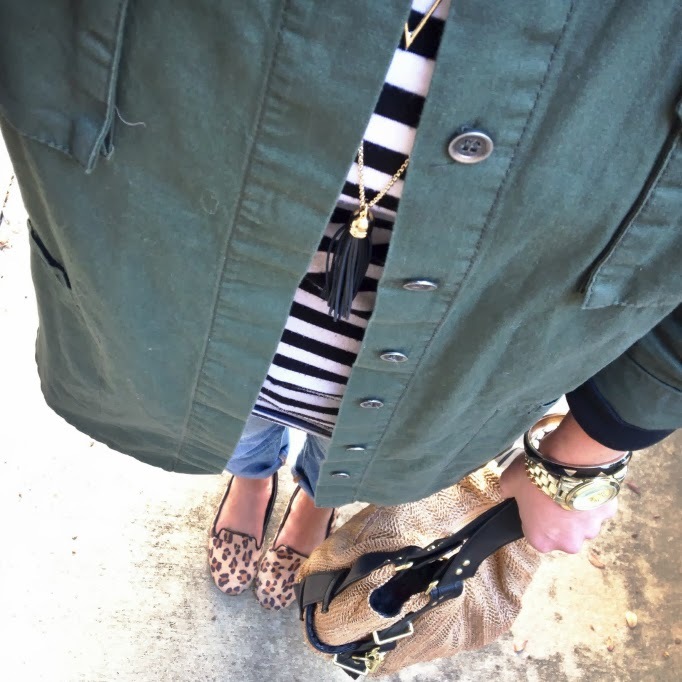 This one is perfect for weekend wear and has been a favorite of mine lately; stripes, military inspired, boyfriend jeans and a splash of leopard print. You just can't go wrong with this combination. Hope you got a little inspiration today and that you all have fabulous weekend. It's supposed to get CRAZY cold here this weekend, so we plan to light a fire in the fireplace, turn on the iTunes Christmas jams, make some hot chocolate and let the holiday decorating commence. I am so giddy and Mariah Carey's "All I Want for Christmas is You" will be the first song on the playlist. You know you love it too. See y'all Monday! Have a safe and fun weekend! I have a huge obsession when it comes to stripes and anything military!! Love this outfit and the little leopard details!! Cute!! Loved this outfit!! Glad to see it laid out in a style board so I can get personal with all the deers. This outfit is so cute! I love stripes! This is perfect for fall! I truly love this entire outfit! Love this! Especially love the addition of the leopard print! This outfit is definitely one I'll be recreating! Stripes and leopard print always win me over. Have a great weekend! always love these posts!! so so cute! Cute and comfy weekend look! I have to wonder what your definition of cold is, haha! It'll only be in the 30s here on Sunday, whomp whomp. Stripes are my all time fav pattern! You rocked it with leopard print!! Hope you are having a wonderful day! Love this neutral outfit with flair! Yes, stripes and leopard are now neutrals. Mind blown! I am loving this outfit, and also loving that there are very little rules for fashion these days, and placing the more patterns and color palettes together, the better! Love this look. Casual and chic, just my style. Happy Friday! I have been seriously coveting leopard loafers and tassel necklaces- THANK YOu for the links!!! I'd wear this entire outfit, head to toe! Love that outfit! So cute! Love, love this. I am extremely addicted to the military, moto, and utility style right now. Love! i think my favorite part of the outfit is the shoes- but what girl doesn't love a good pair of leopard shoes? have a wonderful friday. Wait, does that tshirt have leather on the sides?! How fab!! Love this look, great layers! Thank you for putting together a great outfit that doesn't break the bank. Looks like a million bucks! Those leopard print shoes are super cute! So tempting as they are on sale. Stay warm this weekend! Yay for finally having cold weather! It's happening here too! Love your outfit! It's supposed to be freezing here in MN as well! All I want for christmas is definitely one of my favorite christmas songs! How Do You Shop There?